“ Chanel is to donate the exhibition pavilion designed by Iraqi-born British architect, Zaha Hadid, winner of the 2004 Pritzker Prize, to the Arab World Institute. The pavilion showcased artworks by contemporary artists inspired by Chanel’s iconic bag in 2008. Chanel will thereby perpetuate this work designed by one of the greatest contemporary architects. Hadid’s unique pavilion was widely appreciated during Mobile Art’s world tour and came to the attention of the Arab World Institute who contacted Chanel to express their interest in it. 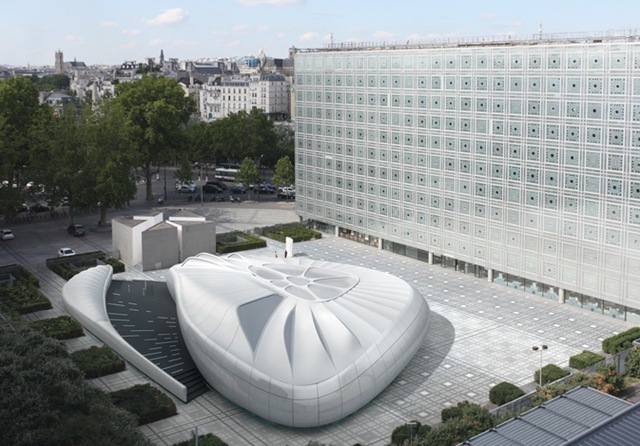 Early 2011, the pavilion will be installed in front of the Arab World Institute, in the unique architectural environment of this prestigious cultural institution, which is open to all in the heart of Paris.